2. Stream of Consciousness - One of their best instrumentals and they haven't played it since the TOT tour. It would also help James rest his voice during the show. 3. The Killing Hand - My favorite song on WDADU. Hasn't been played in a looooooooooooong time and it would be the perfect song to celebrate WDADU's 30 years in 2019. No need to play the whole album or anything, just include TKH. 4. Beyond This Life - Also one of my favorites. If they're going to include anything from SFAM, it should be this song. It's perfect from start to finish. Also, 2019 = 20 years of SFAM. 5. Blind Faith - Not a short song, but not too long either. Would love to see this lineup play it. The instrumental section is SICK. 1. Solitary Shell - I am shocked that no one mentioned this one, I thought it was a fan favorite and hasn't been played for ages! It is short, catchy and THAT Bridge. Also Double Neck Guitar. 2. The Glass Prison - Everything has been said about it, just for getting counted another time. 3. Octavarium - As the new epic closer for the encore. Hasn't been played since the corresponding tour. It would be interesting to see what Mike adds to it and if Jordan touches the intro. 4. The Enemy Inside. Killer Song, that works great live. 5. Home - Maybe with a jam in the middle? If they play Surrender to Reason and/or Octavarium, they're going to need a 12 string guitar anyway, so just play Solitary Shell too! 1. Octavarium - the most original and cool rock song ever. 2. (now it's a bit harder to choose). BAI, - I understand it's been played a lot, but I love it and haven't seen it. 3. In the Name of God or In the Presence of Enemies - 1 & 2 - please forgive me for the little rule bend here. Too Hard To Decide. 1. Octavarium (in its entirety - someone above suggested they should play it without the intro, and that would really take away from the song's greatness to me). Over the last few years it's become my favourite DT song. 2. In The Presence of Enemies. Another favourite of mine, not sure if it's been played since the Systematic Chaos tour. In any case I've never seen it but would love to. 3. Misunderstood. Just a very cool song and quite unique in their catalogue. 4. Illumination Theory. Love this piece and would like for it to become a staple, unlikely as that probably is due to its length. 5. Eve. Just a beautiful song. 1. In the Name of God: Saw it back on the 2004 tour and it was incredible. Wouldn't mind seeing it again. 2. Blind Faith: This is the song from SDOIT Disc One that I haven't seen live yet that I'd really love to see. 3. Outcry: Love the middle section. 4. Panic Attack: I would love to see Mangini tackle this one. 5. In the Presence of Enemies: My favorite of their latter day epics. I was just thinking about doing a poll about this, but with songs that they haven't played with MM yet... This is a good idea too.. I could anyways do the poll a few weeks from now with the songs orderly according to these results so is easier to find the songs for most (I was thinking of giving 5 options)..
Ok, so I'll make two lists, in order to answer both questions..
1) *any song from Train of Thought*: favorite album and out of the approximately 75 songs I've already seen live none of them was off this album.. I could've easily full the three spots with songs from this album, but feels like cheating and/or pointless..
2) Octavarium: well, talking about cheating, if someone is asking me what one extra song I'd include in a given setlist if I have that power, I'd surely use my gift to choose between the epics, and while this isn't my fav epic (TCoT is) I haven't see it live, as many other ppl..
3) The Ministry of Lost Souls: yeah, I've heard here and there that this song live might loose some of its strength, but I'm willing to live, die and kill to verify it.. I just love the song, and even when is a very unlikely option because is not a fan favorite and also takes a lot of time to the setlist, I'll continue to pray for seeing it at least once..
-Erotomania: sick instrumental (also, it's not in any dvd)..
-Voices: because you cannot play the previous without playing this one.. Not a big fan of it, but only the beginning and the "thought disorder-dream control" section make already the song very worth to see it live (also, it's not in any dvd)..
-Surrender to Reason: killer song, and one that will definitely see the light in one of the next two or three tours for sure (also, it's not in any dvd)..
tl/dr: you just missed lots of DT lyric references.. Considering its popularity and the fact that it hasn't been played since 2006, it does feel like it is time to bring back the song Octavarium. I have to think that a lot of "on the fence about going" fans would go just to see that. Can I change my top song i want to see? Because Blind Faith would be perfect. Agreed. I'm actually surprised to see it in so many people's lists here, even though it's arguably my favorite DT song ever. If they were to play that, that is an insta-buy for me, no question, I would be going for that song alone. I hope for the whole SFAM in the setlist sometime. Maybe next year for a 20th anniversary? Yeah I agree, I think them playing 8V again would be a good draw. 8VM, Stream of Consciousness, Surrender to Reason. It's crazy to think that I actually could see those songs now that the band have made NC a staple! It's not a certainty but they always said that they would play in future tours the missing DT12 songs (missing from the Along for the Ride tour I mean). They've played Behind the Veil in the anniversary tour, they played The Bigger Picture in the I&WAB tour, I think it's quite safe to assume, although the certainty will only be there once the tour starts, that we'll get Surrender to Reason next time. 1. The glass Prison - I would love to hear MM on this! 2. A Nightmare to Remember - since the drummer’s audiction, the same above. 3. Beyond this life (with extended solo) - just to see this great song again and some improvisation. 4. Surrender to Reason - to complete the MM era songs live. 5. Stream of Counciousness - I agree, great instrumental. 1. 8V - I agree, this song must return for the next tour! 2. Stream of Counciousness - now, just to make more votes, this song deserves it! Yes it is. 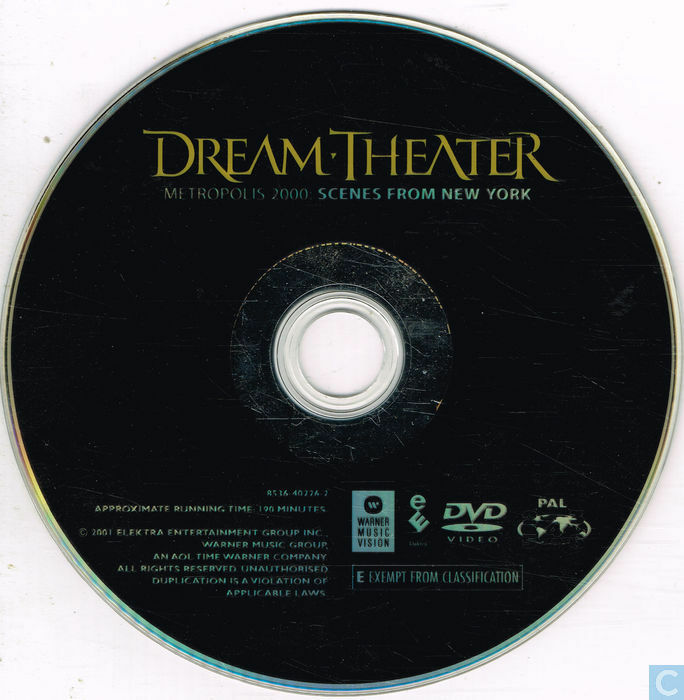 The entirety of "A Mind Beside Itself" appears appears as one of the "bonus tracks" (or I guess it's three separate tracks) on the Scenes from New York DVD. Probably couldn't be more clear than that! By the looks of it, they might play Octavarium again next year, so if they're using the 12 string for that song, why not STR too? 1) In the Name of God: because is the one with more votes from ToT as of yet (although SoC is not that far), and I think it'll remain that way.. But is not a DVD... is a VHS..
Kind of surprised by the love for Ministry of Lost Souls. I always thought the song was fine, and I enjoyed it live, but thought a lot of fans really didn't like it. Yeah I've always thought that was a sleeper song. I remember not many people were keen on it when SC first came out, including myself, but over the years it's really grown on me. I think it's the one from SC that has aged most gracefully, even that instrumental section in the middle. I love that it takes its sweet time and tells a story with such a beautiful melody in the verses, and the guitars are lovely as well. Great hook, I'd love for them to bring it back for a tour if they're willing to make 15 minutes of room for it. Yeah, I am surprised too. But even though I don't much care for the song, I bet I would enjoy it live. Or at least wouldn't mind it. No, it is a DVD. I have always thought that *Metropolis 2000: Scenes from New York was realeased as VHS, like 5 Years in a Livetime and Images and Words: Live in Tokyo, and only afterwards released as DVD (like you can nowadays release a given DVD in Blu-ray)..
Ok, never mind.. I always count from Budokan onwards, about this kind of things.. It was released as both VHS and DVD, I have them both! The VHS did not have any bonus tracks on though from memory. With regards to Ministry Of Lost Souls, it's the opposite of what was said above for me. It was an instant favourite on SC for me and my love for it has waned a little over time but I still included it on my list. I don't recall seeing it live although I did see the SC tour so would be interested to see how it works, some gorgeous epic guitar playing from JP on this one that I'd love to see live. There was a problem with the original run of European PAL DVDs, which ended up being recalled and destroyed by Warner before release date. The VHSs (and I think some working copies of the DVD) were released in April 2001, but the remastered/corrected DVDs came out in November/December. Maybe that was the cause of confusion. 1 Stream of Consciousness- I would love to see what Mangini would do with this one. 3 Octavarium- Seems like everyone else wants to hear it too, and rightfully so.